WiMAX: A Contender or a Pretender for 4G Wireless? What is now called “Fixed WiMAX” is the original IEEE 802.16 standard, first published in 2001. 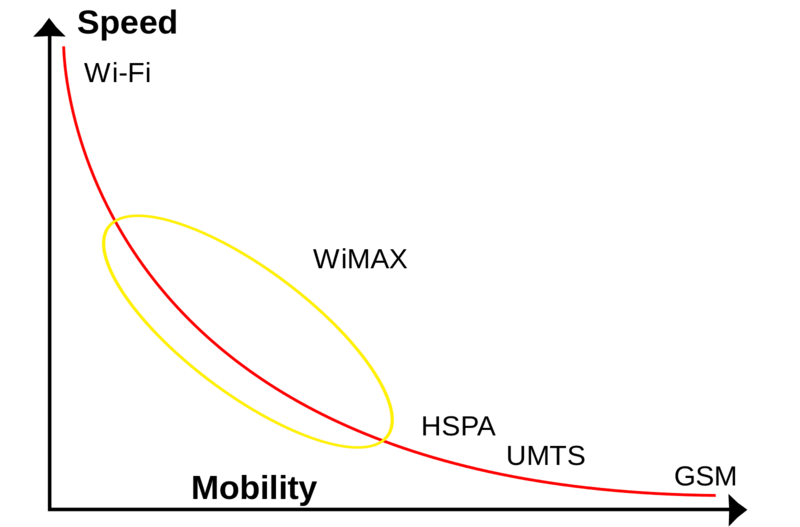 “Mobile WiMAX,” initially based on the 802.16e amendment from 2005, is the revision most often deployed around the world, and has been subsequently revised as 802.16m-2011 (which provides for 1 Gbps). The versatility of the WiMAX technology allows for various applications such as high frequency backhaul, Voice over IP (VoIP), broadband connection and hotspots or access points. Fixed WiMAX was envisioned to provide wireless broadband in locales lacking wired infrastructure. Mobile WiMAX is embedded in mobile and electronic devices (laptops, SmartPhones, digital cameras, etc.) for Internet connection for use while traveling. The WiMAX Forum claims that the technology offers 30 Mbps within an area typically served by macrocells (~3 km). But according to Marshall Brain and Ed Grabianowski of howstuffworks.com, one single WiMAX tower can cover 3,000 square miles (~8,000 sq km) — a 30 mile (50 km) radius the size of Delaware and Rhode Island combined or an area three times larger than Luxembourg. WiMAX and Wi-Fi — How Are They Different? There are two basic forms of WiMAX transmission: Line of Sight (LoS) and Non-Line of Sight (NLoS). NLoS WiMAX makes particular use of OFDM and beamforming, operating on frequencies between 2 GHz and 11 GHz (which also encompasses the Wi-Fi spectrum). LoS is WiMAX backhaul mode, quickly transmitting/receiving large amounts of data between antennas over bandwidths from 10 GHz to as wide as 66 GHz. Higher frequencies encounter less interference since less traffic uses the bandwidth (no Wi-Fi or cellular transmissions clogging up airwaves). On 31 March 2016 Sprint finally discontinued their Clear WiMAX service, signaling their final capitulation to Verizon and LTE as “the next generation 4G” technology for wireless devices. 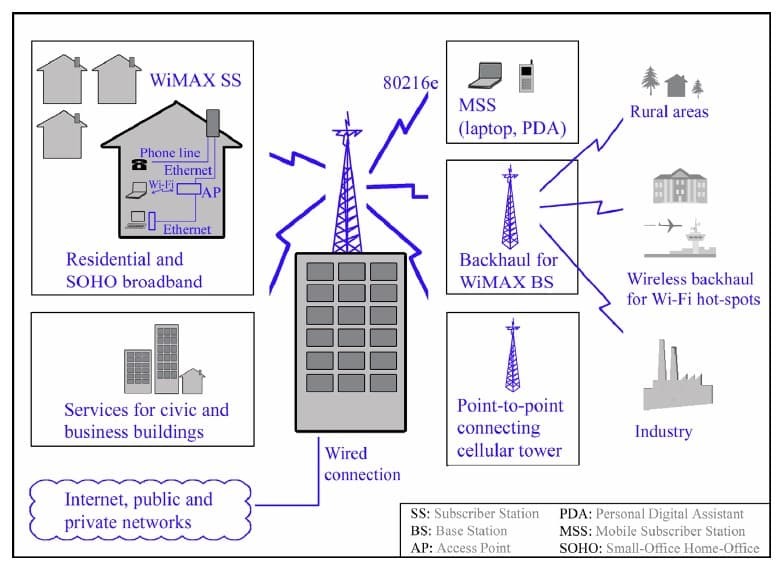 The handwriting hit the wall for WiMAX’s demise as a Sprint transmission platform when in 2011 the company announced it would adopt LTE technology onto its network. Although Sprint initially planned to run both LTE and WiMAX concurrently, each utilizing different spectrum, all of the company’s WiMAX capital investment was plowed into LTE. Sprint assumed their WiMAX network when the company acquired Clearwire aka CLEAR, the nation’s 5th largest wireless provider with 11 million WiMAX users prior to Sprint’s takeover in summer 2013. . Due to litigation, the Clearwire WIMAX network remained operational without customers beyond November 2015 when the service was terminated to subscribers before the final denouement in March 2016. The Clearwire spectrum has now been retooled for Sprint’s LTE network. 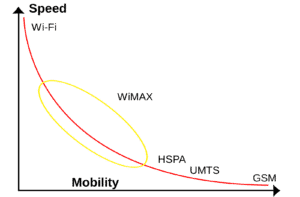 WiMAX vs. LTE — Ethernet vs. Token Ring Redux? Likely, most younger members of our audience have never heard of Token Ring but 20 and 30 years ago a titanic struggle was fought between Ethernet and Token Ring for networking technology supremacy. IBM touted Token Ring while Digital Equipment Corp., Xerox, Intel and 3Com supported Ethernet. Even though it can be argued that Token Ring was the superior technology, price and convenience eventually won the day for Ethernet. The same scenario is playing out today between WiMAX and LTE. Each technology has its pros and cons but on balance WiMAX appears to be a better option than LTE with the exception of device power consumption. 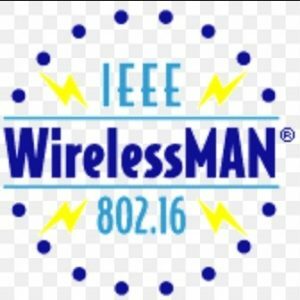 According to Todd Giffen, a blogger at dslreports.com, WiMAX is superior to LTE because (1) WiMAX is faster over the same spectrum with greater spectrum efficiency and (2) WiMAX, like Wi-Fi, is an open source platform. Thus all sorts of different devices and companies can use WiMAX standards without paying licensing fees or royalties, providing a more affordable product for consumers. LTE is very much a carrier-driven platform with proprietary technology. It’s tragic for consumers that LTE and WiMAX aren’t like Coke and Pepsi. Instead it’s become VHS versus Betamax. Below is a video released in the summer of 2009 “explaining” WiMAX and LTE. It provides historical context to the ongoing demise of WiMAX deployment in the United States. The associated blog, http://www.goingwimax.com/articles/blog/, posted its last article on 30 January 2013. There comes a tipping point with communication technologies when enough equipment manufacturers embed a standardized technology with compatibility (like Wi-Fi or Bluetooth) into their products to force competitors into doing the same. Verizon, which went all-in on LTE early on, has been the largest domestic wireless carrier for years. Their foothold on the U.S. market has for the most part squeezed out WiMAX, particularly in densely populated urban areas. In the United States, buying a LTE-enabled mobile device in 2016 is easy; finding a WiMAX-enabled mobile device is more difficult. This wasn’t the case five or eight years ago. Visit https://www.frequencycheck.com/ and see how many WiMAX-enabled devices are now available for use in any country in the world. 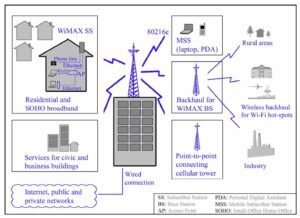 WiMAX has remained an attractive option in rural areas in North America, as well as in many economically-emerging countries, although reportedly many wireless carriers in Africa are migrating their networks to LTE. Examples of regional North American WiMAX operators include New England’s Fairpoint Communications, MegaPath, Towerstream and Canada’s CCI Wireless. Below are WiMAX-enabled devices, per gsmarena.com as of 12 June 2012.